Here you have an E-Flite Blade Mcx2 Ready To Fly Helicopter !! This package will include the Heli, Transmitter, 3.7 Volt 120Mah Li-po Battery Pack, Charger, (8) AA Batteries, Owners Manual & Protective Storage Box !! You can simply charge onboard battery pack, install batteries in transmitter & Fly !! Please understand that this package includes the complete Ready To Fly E-Flite Mcx2 Heli, Original 120mah Battery Pack, Transmitter, DC Charger, Batteries for the Transmitter & Charger, Owners Manual and Original Protective Storage Box. You can't go wrong here when you will receive a Complete Ready To Fly Heli Kit, you have a low Purchase Price Of Only $89.00 and if you buy it now, you can receive it in just a "few days" !!! 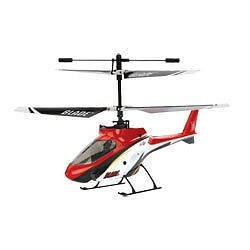 So take advantage of this limited time offer and get this Great Heli Now !!! This is an all original Teriffic Heli and would make a Great Gift !! Overview Like the original Blade mCX, the Blade mCX2 is easy enough for anyone to fly and small enough to fly just about anywhere. The mCX2 has the same coaxial, counter-rotating rotor head design as the current mCX, but it adds an extra shot of excitement with user-selectable swash sensitivity and flashing LED lights that are built right into the body. The pilot can change the control settings to enable this heli to perform at higher speeds than the beginner settings. This helicopter also boasts heading-lock like performance for maximum control. It also boasts more powerful motors and a higher capacity 120mAh battery pack. The mCX2 is the ultimate beginner friendly machine with unsurpassed stability, incredible control, and extreme durability. With a factory-installed 5-in-1 control unit with Spektrum 2.4GHz DSM2 compatible receiver, main motor ESCs, mixer, gyro, and fully-proportional servos come pre-installed. Freedom from frequency restrictions and great control are ensured with the MLP4DSM 4-channel 2.4Ghz Spektrum technology equipped transmitter. The Blade mCX2’s ultra-micro size and weight make it possible to fly this heli anywhere indoors. It all adds up to more fun than you ever thought possible with a coaxial ultra micro heli, whether you’re a newbie or a pro. Everything needed is included in the box.